To investigate the agreement between double-inversion recovery (DIR) with synthetic magnetic resonance imaging (MRI) and T1-weighted contrast-enhanced (CE)-MRI for the assessment of knee synovitis. T1-weighted CE-MRI and synthetic MRI of 30 patients were compared. Synthetic DIR image reconstruction was performed with two inversion times (280–330 ms and 2800–2900 ms). Subjective image quality, visibility of synovium, detection of synovitis, and total synovitis score in the knee joint were evaluated on both MR images. The relative signal intensity (SI) and relative contrast of synovium, joint effusion, and bone marrow for two imaging were assessed. Differences in data between two imaging were assessed by using Wilcoxon’s signed-rank test and chi-square test/Fisher’s exact test. Interobserver agreement was expressed as weighted kappa value. Accuracy of synthetic DIR image was calculated by using CE-MRI as reference standard. T1-weighted CE-MRI yielded better image quality than synthetic DIR imaging (p < 0.001). Interobserver agreements for detecting synovitis diagnosis/sum of the synovitis score were moderate to almost perfect (κ = 0.58/0.44, synthetic DIR; κ = 0.83/0.65, T1-weighted CE-MRI). There were no statistical differences in visibility of synovium (p = 0.058–0.190), detection of synovitis (p < 0.001), and relative SI of structures between two imaging (p = 0.086–0.360). Synovium-to-effusion contrast was higher in synthetic DIR (p = 0.003) and synovium-to-bone marrow contrast was higher in CE-MRI (p < 0.001). Synthetic DIR imaging showed a moderate degree of interobserver agreement and good accuracy for detecting synovitis. Though it has limitations, it may play a role in imaging of degenerative joint disease or larger cohort scientific studies where gadolinium application is not feasible. 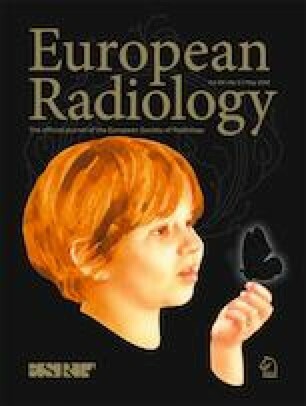 • Synthetic double-inversion recovery (DIR) imaging avoids the use of contrast agent. • There was no significant difference between T1-weighted CE-MRI and synthetic DIR imaging in evaluating presence of synovitis in knee joint. • Synthetic DIR imaging showed moderate degree of interobserver agreement and good accuracy for detecting synovitis compared to CE-MRI, and it may facilitate evaluation of some regions of peripatellar synovitis. This work was supported by a National Research Foundation (NRF) grant funded by the Korea government, Ministry of Science and ICT (MSIP, 2018R1A2B6008076). The scientific guarantor of this publication is Young Han Lee.